I’m pushing 50 – in fact, next month, I will be 50. Which means, since the average American male lives to be 79, I’m almost two-thirds of the way through my life. And yet, often, I feel half my age – especially when listening to music. It dams the river of time. 5) Van Morrison – “River of Time.” This song hails from one of my favorite Van albums, Inarticulate Speech of the Heart. The melodies float through the ether like ripples in a pond or waves in the ocean; and sound as fresh today as they did in 1983. Earlier today I rustled through a few of the many boxes still cluttering my den after last year’s move and, in one, found dozens of issues of Record magazine. For those who’ve never heard of it, and I suspect that’s most folks reading this, it was a Rolling Stone offshoot that focused only on music and, unlike its biweekly big brother, came out once a month. I grabbed one at random: the May 1982 edition. 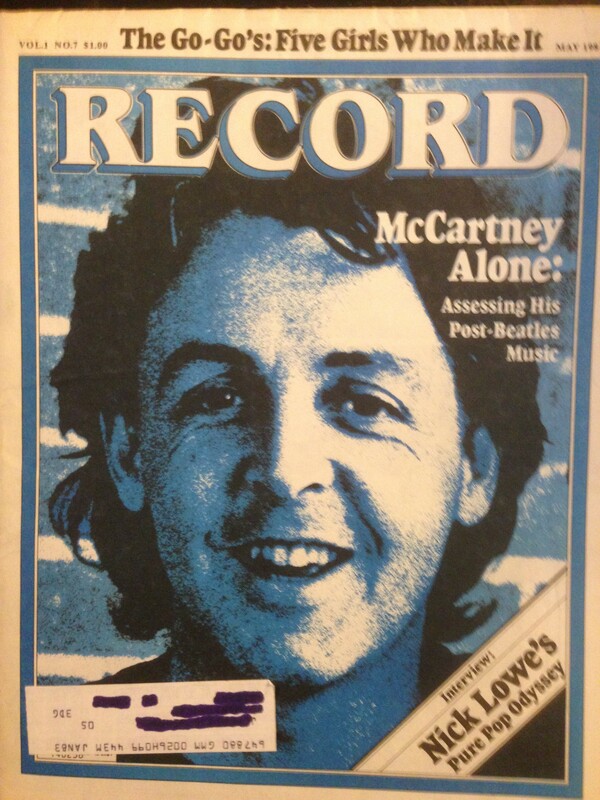 I remember, when it arrived in the mail way back when, being excited that Paul McCartney was on the cover, as I was a major McCartney fan. I still am. 4) Paul McCartney – “Tug of War.” The title tune to his classic 1982 solo album, which was released the month prior. I listened to the album in full this past week and have to say, it’s held up very well. Definitely one of his best. 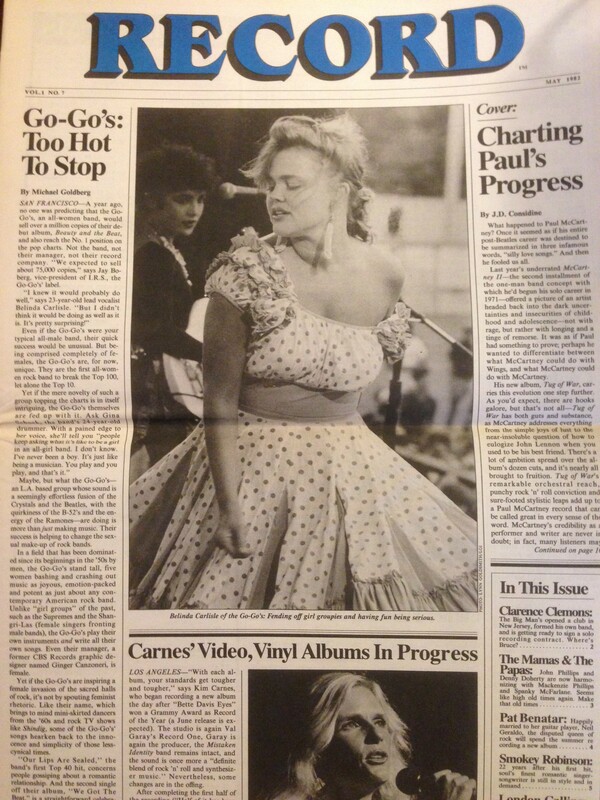 I also thought it cool that the Go-Go’s were the focus of a lengthy article that went beyond the novelty factor of five gals being in a band. “The Go-Go’s stand tall, five women bashing and crashing out music as joyous, emotion-packed and potent as just about any contemporary American rock band,” writes Michael Goldberg. Among the other things he explores: the pressure surrounding their second album, Vacation. The record-company execs wanted to wait until the fall to release it (and milk Beauty & the Beat sales for all they could) while the group wanted it out sooner. 2) First Aid Kit – “Emmylou.” It’s safe to say that Swedish sisters Johanna and Klara Söderberg are my favorite (relatively) new act. They’ve been around for more than a few years, of course, but their first few albums (as I’d wager they’d admit) were decidedly hit-or-miss affairs – a gem here, a gem there, but by and large their inexperience showed. Credit them with sticking to their craft, however, because their 2012 release, The Lion’s Den, was just plain great. They performed one of that album’s (many) highlights for the woman who inspired it, Emmylou Harris, at last week’s Polar Music Prize ceremony. Such a crush on Jane Wiedlin. Not sure it’s over yet.